In SEO terms, a link/backlink/inbound link is a hyperlink from one website to another. Link building refers to the effort of acquiring these links to improve a website’s rankings on the search engine results pages (SERPs). There’s no question that links are crucial in improving a website’s rank on the SERPs. A search ranking factors correlation study conducted by Moz and a new Google ranking study concluded that links are among the more influential factors for search engine rankings. Do your links offer any value to the user? Are your link destinations contextually relevant? Are your links self promotional in nature? If the answers are yes, yes, and no, you’re on the right track. Remember that links with the nofollow attribute aren’t counted in Google’s overall algorithm. The kind of links that will get you on the first page of Google are editorial links. That is, links that are placed in the content body of a blogpost, article, or whitepaper. Let’s look at two examples of editorial links from two separate articles. According to a study <= (link) conducted in 2012, 80% of people love sushi. Today, selling insurance policies <= (link) is even more challenging than it was 10 years ago. In example A, clicking on the anchor text “a study” would take you to a research paper to back its claims. In example B, the anchor text “insurance policies” would take you to the author’s insurance policy sales page. Which do you think offers more value? Which do you think is more contextually relevant and non self promotional? – Example A is the clear winner. If you want to acquire high quality links (and we’re talking about links that really move the needle in rankings), you have to keep one key thing in mind – Can you provide value in exchange for the link? Let’s say you’re reaching out to a popular food blog to write about your newly opened restaurant, what incentive could you give the blog to feature you? You’d probably have to offer something like a $100 dine-in voucher. If we’re talking about well-known blogs, they would charge you a handsome fee for their review. Similarly, if you were pitching a guest article to a popular blog in your industry, you’d have to make sure your content provides great value to their audience. One of the best advices from Rand Fishkin is to give before you receive. Reach out to your community’s top influencers, friends, colleagues, and associates and ask them whether there’s anything they would like you to promote to your network out of good will. Link building is an on-going process. You don’t just build links overnight and expect to rank on top forever. There’s always going to be competition. It also takes awhile for search engines to pick up your links and work out your rankings. So be consistent if you intend to stay on top. It starts from analyzing the landscape, defining your linkable assets and target audience, developing and executing your strategy, and finally measuring your success so you can optimize better for the next campaign. PS: We’ve also included a link building methodology template to use when executing your link building campaigns. Imagine you’re planning to launch a roundup and your goal is to acquire backlinks to it. Where do you start? You could start by analyzing the results of similar roundups that have been published in the past. 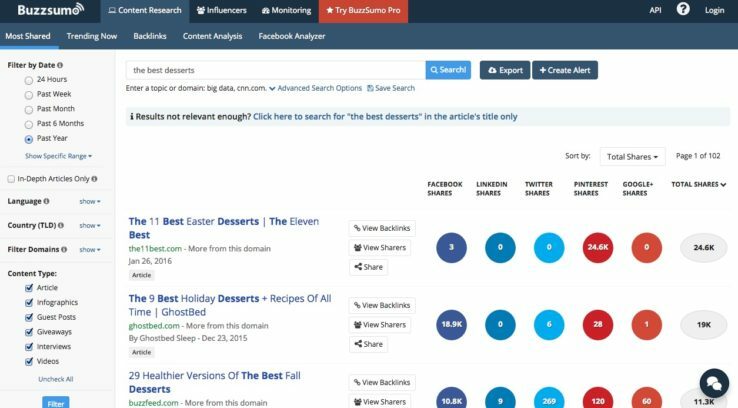 Using tools like Buzzsumo and Ahrefs, find out the quantity of social shares and backlinks these articles earned. If you’re not seeing the success (lots of social shares and links) that you’re hoping to achieve, it may be a better idea to try a different content idea or you might end up in the same boat. I recommend reading this post by David McSweeney on 8 Actionable Ways To Get Backlinks By Spying On Your Competitors. We once did a roundup titled 40 web design trends in 2015. This article was picked up by the Slideshare team and featured on their homepage. With this credential, we reached out to 40 different people mentioned in our blogpost and got a response rate of 20% – some invited us to guest write for their blog and others told us they loved it and would share it on their social networks. However even with all that effort and buzz, we only managed to secure one link. Quite a letdown, considering the buzz and enthusiasm it generated. Had we analyzed the results of similar articles beforehand, we’d have discovered articles like these do well in acquiring social shares but weren’t very “linkable” so to speak. How then would you go about analyzing the landscape if you’re a startup and your website is newly launched? If your site is new and you don’t have any idea where to start, a good way would be to Google your top 5 competitors and analyze their link profiles. This may help you to spot some link opportunities you otherwise wouldn’t have thought of. Here’s what we did with one of our websites (in the training room rental niche). 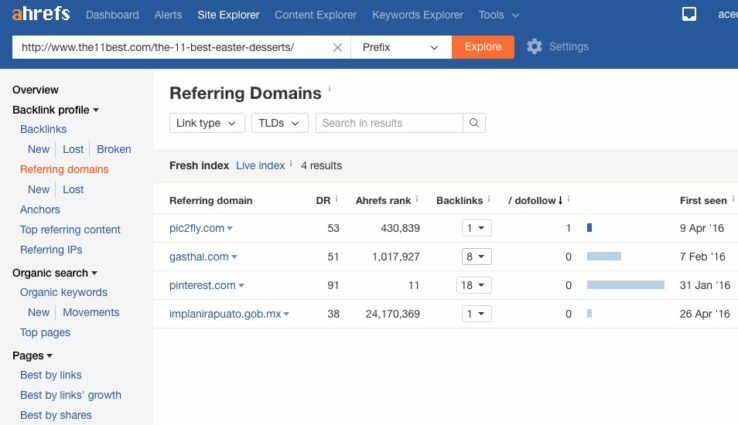 Upon analyzing the backlinks of our competitors with Ahrefs, we found that customers were linking to their “how to get there” page from their event landing pages. This made a lot of sense given how detailed the directions to the training centre were. With this new insight, we replicated that strategy and suggested to every new customer that they could link to our “how to get there” page from their event landing pages so their attendees wouldn’t lose their way. You can see how detailed our directions to our training rooms are (it’s really about providing value). In the next section, we’ll go through what you need to define in order to devise effective link building strategies. What are your objectives (how many links do you intend to earn)? What are your linkable assets (your content, products, how-to guides, resource pages)? Who are your target linkeratis (people who will link to you)? Your objectives shouldn’t just be limited to earning links. They should also aim to drive brand awareness, build relationships, and increase your social presence. If your only objective for guest posting were to earn links, you wouldn’t really care where your article went as long as you acquired the links. You’d submit your blogpost to random article directories, low quality blogs, etc. Say if your objectives were to increase brand awareness and drive traffic back to your site, you’d be looking at very different avenues (popular blogs with lots of user comments and domain authority). What are your linkable assets? Before you decide whether a piece of content, resource, or product is link-worthy (something people will not hesitate to link to), put yourself in the shoes of people who might link to you. Would it provide any value to the target audience? Is it self promotional by any nature? There are a ton of spam guest contribution requests out there. If you’re outsourcing a 500-word guest article for $5 and linking heavily to your product-centered content, your pitch will probably get deleted. Who are your target linkeratis? Your target linkeratis are people who might link to you. They range from bloggers, forum users, to content creators and resource editors. An example of a resource editor would be a government official managing a “useful links” resource page. In this case if you have something useful to contribute to that page, ensure your outreach formally written. No slangs and informal abbreviations. On the other hand, if you’re reaching out to an industry blogger to submit a guest post, you can add a little personal touch to your outreach email (e.g. telling them how much you like their content). Why would I link to this? Would it provide any value to my target audience? Once you have defined your objectives, linkable assets, and target audience, it’s time to develop and execute a strategic approach to acquiring those links. If you don’t have any existing linkable assets, you can start by creating evergreen content (content that never becomes outdated). It could be a case study with comprehensive and conclusive research data, a definitive guide, a huge list post, a glossary of industry terms, and anything that is impossible to create for five bucks. This can help you to attract links naturally and also allow you to link back to them in your guest posts. Browse popular articles with lots of social shares through Buzzsumo. Do keyword research on industry search terms and create 10x content (content that’s 10 times better than any other similar content). When your content is ready, publish it on your blog and promote it. If you’re new in your industry, your newly created content will be like a tree on a remote island. You have to get the word out if you want to earn links and social shares. Send outreach emails to people who might be interested in it, share it across all your social channels, and link to it from existing blogposts (both on-site and off-site). If you’re intending to submit a guest article to a popular blog in your industry, make sure your topic is relevant to the blog’s audience and your content is unique and highly useful. Otherwise your pitch will most likely get rejected. 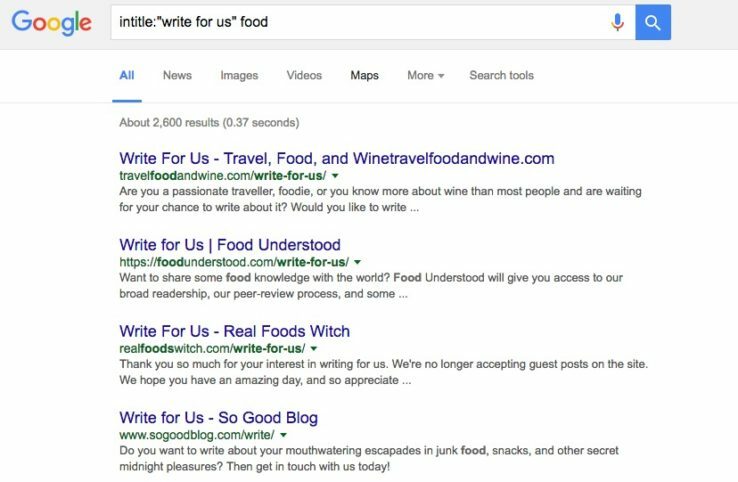 Use advanced search operators to find blogs that accept guest posts. An example would be typing intitle:”write for us” your industry to yield search results of blogs in relevant industries that accept guest contributions. The pitch is important especially if a site does not openly invite guest contributions. For that, I suggest you check out outreach letters for link building by Peter Attia. If a site already has guest posting guidelines set in black and white, be sure to read them very thoroughly before you decide whether or not to contribute. There may be cases where you realize your content idea may not be what the site is interested in. I’m [name], constant and avid follower of your blog posts and I’ve liked most of the blog posts written here. I noticed that you’re accepting guest authors on https://www.equinetacademy.com/become-contributor-write-us/. I also realized you’ve already published some great guest posts from different authors with distinct styles and I’d be privileged if I were provided with an opportunity to delight your blog followers with some informative blog posts. I’m a content expert and I’ve contributed some sensible and informative articles to surplus niche-specific blogs. I realize the value of content and its part in helping out numerous people out there in the space. The blogs offered by me are absolutely free of cost for your website. As a reward, I would like to earn dofollow backlinks from your end. I think I’m crisp & clear. If you have any confusion for the aforementioned points, you can freely revert me. Looking for a positive response! Unless you want to piss Matt Cutts off, don’t ever mention you would like to earn dofollow backlinks in return. Just… no. The above email pitch doesn’t tell us much about the author or their writing style, except that they’re pretty much hungry for backlinks. Do you accept guest contributions to [site name]? I have previously published for a variety of online publications on marketing topics and was wondering if I could possibly guest write for you too? My most recent article published to date here: [reference your recent post on an authority site], but I have also published for [authority site 1], [authority site 2], and many others. I publish quite a bit on [topic] and could write about anything you have a content gap. Through referencing your previous guest contributions, one can see your writing style and profile. If you want to maximize your approval rate, I suggest writing for the top blogs in your industry first. Last but definitely not least (if you’ve already made it far enough and have gotten a response), don’t disappoint with thin and low quality content. Write something that offers a unique perspective on a trending topic, be detailed with examples, free it from grammatical errors, and basically try to follow everything outlined here and here. Search for popular bloggers in your niche using tools like Followerwonk.com, Alltop.com, Buzzsumo.com, and just browsing through social media channels such as LinkedIn, Twitter, Facebook, and Google+. Make it a commitment to comment daily on at least 3 to 5 blogposts/social media posts/forum threads of your target linkeratis to build rapport. Once you’ve built rapport and gained their trust, they will be more willing to look into your link requests and accede to them. As mentioned above, one of the best relationship building advice by Rand is to give before you receive. Send an outreach message to them, tell them that you love their content, and ask if there is anything they’d like you to share with your audience. 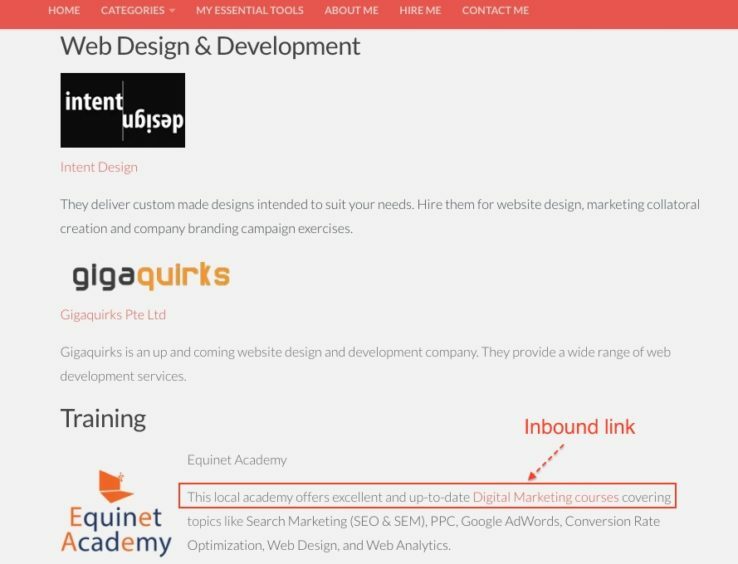 Just as how bid4skill smoothly executed their link building outreach campaign by doing a roundup featuring recommended digital marketing training providers (including Equinet Academy), and then reaching out to the training providers they featured to explore potential collaboration opportunities. Through building your online presence, you may have earned some name/brand mentions from loyal customers or industry associates. These mentions could be anything from recommended partners (like the ones below) to testimonials. 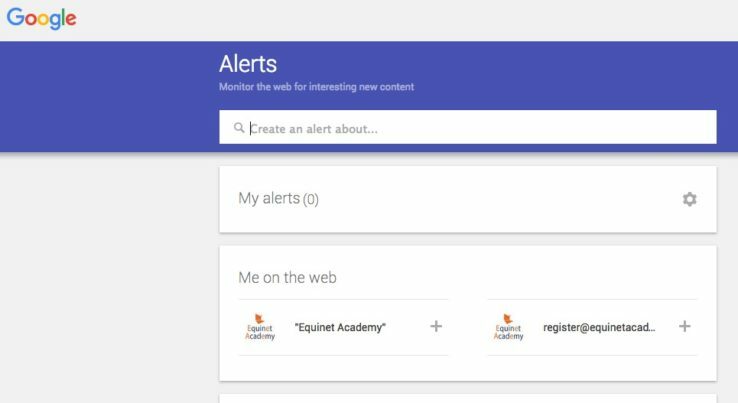 Browse through the blogs of your contacts on a regular basis and spot any opportunities for link requests, or use a tool like Google Alerts to alert you of any name/brand mentions (both yours and your competitors’) found across the web. For Google Alerts, make sure you wrap your brand name in double quotations to avoid any irrelevant notifications. So for example if your name is Dylan Sun, make sure you set the alert as “Dylan Sun”. Otherwise you might receive content that include phrases like “Bob Dylan” and his soundtrack “House of the Rising Sun”. If you do manage to find any mentions from close friends, business associates, and past happy customers, all you have to do is ask them to convert the mention into a link. Ensure your site is free of viruses and looks trustworthy (no broken image links and 404 pages) before submitting to any directory. Use advanced search operators to find directories and resource pages (e.g. intitle:”business directory” intext:”your niche”). Generally you’re looking for directories and resource pages that have human reviewers manually approving submissions. You want to make sure you fulfill the stated requirements of a directory, especially if you’re submitting product-centered content (e.g. a course outline) to a course directory, otherwise the chances of getting approved are slim. Early this year in Singapore, the Workforce Development Agency (WDA) launched a national movement known as SkillsFuture which provides SGD$500 in credits to every Singaporean above the age of 25 to apply for approved courses. Our company was one of the first to submit our courses to be eligible for the funding, which got approved under one of the directory’s category listings, earning us a good dofollow link. In order to obtain a high approval rate, your website design also needs to look trustworthy (i.e. not too many ads above the fold of the page, no broken images and links, etc.) and your content has to offer value. 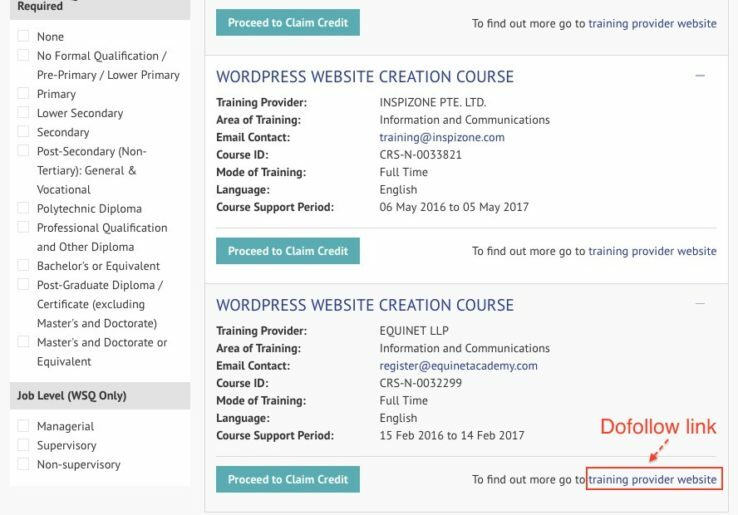 Of course, our WordPress course curriculum had to be really comprehensive and structured as you can see. This example is one of the more common and acceptable instances where product-centered content can earn links, as it is generally more difficult to acquire links to product-centered content than to free, helpful resources (e.g. how-to guides, glossary of industry terms, etc). 1. Your rankings after acquiring the links. Monitor your rankings after acquiring the links through a tool like Firefox Rank Checker or Moz Rank Tracker. Note that it takes 10 weeks on average to see one rank jump. 2. Your link acquisition success rate in terms of percentage. If you sent out link requests to 10 linkeratis and received 1 link, it’s a 10% conversion rate, which is pretty decent. But if you’re sending 100 guest post requests and only getting 1 or 2 replies, you may need to refine your pitch. Do you have a link building framework, guideline, or methodology you apply when doing link building? Please share them in the comments!